Want to watch well cared for sheep relaxing in a clean barn or grazing in pasture, cared for, respected and loved as all living creatures should be. It is such a refreshing change to see animals so contented, well cared for. Below you will find live streamed videos of animals at Farm Sanctuary in Watkins Glen. NY Further down you will find a series of videos concerning the sanctuary’s rescued animals and the work that Farm Sanctuary do to provide a safe environment for hundreds of ill treated and abused animal victims of agriculture, particularly factory farming. Join Susie Coston National Shelter Director in the Farm Sanctuary sheep barn as she answers viewers questions and shares with us her expert knowledge on farm animals. I spent a few hours watching these videos and the ones further down which helped restore my faith in human nature, that there are people who care and are willing to help the abused and exploited victims of factory farming who are incarcerated, tortured and violently killed to satisfy the appetites of thoughtless or ignorant, and maybe even uncaring people, for a food that is not natural and which they do not need. While for the most part sheep here in the UK are not confined to windowless factory farms, tethered as are cows to a stall with hardly space to move or sit down, except on concrete, or encased in crates as are pigs, sheep nonetheless suffer. I live in close proximity to the North Yorkshire Dales and moors and other areas of sheep farming having moved some years ago from the south east to the North. I once enjoyed our many trips to these scenic places designated as National Parks or Areas of Outstanding Natural Beauty. However as time went by the reality of the cruelty and neglect that takes place in these so-called natural places has opened up a whole new perspective and while I continue to visit and to appreciate to some degree the remotesness and semi wildness – though in reality this land is managed not only for sheep farming but also for the cruel pastime of shooting and hunting – this location does not seem to have the appeal it once did. In contrast to the happy contented lively and interactive sheep in the videos above, here in the cold bleakness of the dales in winter and indeed all year round to some degree, there is much suffering. Unlike the sheep in the above videos most sheep in the dales and other places, including fields you pass by in your car without much thought, have their rear ends permanently covered with mud or feces which remains until they are sheared and go through the sheep dip once each year. Many sheep limp, the result of painful arthritis, no doubt untreated with medication. I have come across sheep with hoof rot simply left to get on with it. Sometimes there are sheep who cannot put their leg to the ground, it hangs limp by their side as they struggle to walk. I report as much as possible to the RSPCA who may take action themselves or they will contact the local council department responsible for the welfare of so called livestock . I have contacted farmers if it is possible to locate them, who assured me they are aware of the situation or will look into it. Sometimes I can’t get any help at all. One recent incident was very upsetting when a ranger in the dales fobbed off my report of a sheep walking on three legs with her front leg hanging limp from her side. He rambled on about how common it is – apparently that makes it alright – and how the sheep would soon wander off into the hills and not be located. Incidentally this type of injury or disease where the leg remains hanging limp is not in any case that common and was obviously a severe injury or condition and needed attention. Basically he could not give a damn and would do nothing. I rang the RSPCA who agreed with me that the sheep needed attention, they contacted the local authority for animal welfare. I never knew the outcome. Since that time I do not enjoy our trips out as it is so depressing to see these poor creatures out in all weathers, many limping, dirty, cold and bedraggled knowing there is little I can do to help them. In general many sheep and their lambs, often born unnaturally early, die of expose, from pneumonia or as a result of predators including 15,000 sheep who were killed by loose dogs in 2016. Life for sheep is one filled with misery until they are slaughtered or die as a result of disease, injury and neglect. Note if you see an injured animal domestic or wild make a note of the location, provide as much detail as you can of the animals whereabouts and the problem with the animal, the more detail you provide the better. Take a photo if possible which you can send them if you cannot stay with the animal. Here are the RSPCA’s details. Usually if the problem is urgent and lies within the remit of the local authority the RSPCA will contact them for you. Now enjoy more Farm Sanctuary videos of happy well cared for animals and work towards a time when this cruelty will be a thing of the past. Reel Life at Farm Sanctuary – Ep. 1: Pasture Rotation – This is one of a series which you should be able to access on the side bar if you watch the video in Youtube. There are live cams for cows, pigs, turkeys and the Wisconsin pasture along with many other videos of life at Farm Sanctuary. Some of the live cams do not always show much as it all depends on the time of day and what the animals are doing and the weather, right now it is snowing. Learn more about Farm Sanctuary and the work they do to make lives better for abused and exploited farm animals. This is such great news, a step towards ending the cruelty of farming, the systematic rearing torture and slaughter of sentient beings for a food that is not natural, eaten to please the appetite. How can you watch the Ad? Don’t forget to click the following link if you have not already done so to access lots of help and advice about how to change to a vegan diet. Includes recipes, information about where to shop and to eat out. Also more about Hope the mother pig in the above video. A happier life now for Hope and her piglets rescued from the nightmare of factory farming. After watching the film below I am sure you will agree this is hell on earth. If you eat meat you are complicit! Please consider changing to a vegan diet. The human body has no more need for cows’ milk than it does for dogs’ milk, horses’ milk, or giraffes’ milk. Cadbury’s want you to adopt a cow! Cadbury’s ludicrous promotion comes with a bizarre offer for families to adopt one of 20 cows and enter a draw to win a family farmyard weekend away to meet the animal. I say bizarre because the reality of the situation is nothing like the one they would like to have you believe. The idea aimed at families is to submit an on-line a code number from packets of selected Cadbury’s chocolate and choosing the cow they would like to adopt “based on photos and qualities” provided on the site. In the lead-up to the prize draw in late September, Cadbury will be interacting with families by providing families with “small moments of joy” through regular news and updates from the herd. They also do not know the terrible conditions of cows in factory farms where in reality Cabury’s milk is produced. The milk from the much promoted “Glass and half” does not come from cows grazing in some peaceful idyl in fields of buttercups, with the sun warming their backs and their calves by their sides, in most cases nothing could be further from the truth. Here is the grim reality behind your, glass and a half milk. Like other factory farmed animals the lot of a cow is a life filled with suffering and exploitation in dreadful conditions. The dairy cow is kept constantly pregnant in a continuous and exhausting cycle of misery. Within two to three months of giving birth cows are impregnated again, mostly by artificial insemination. As lactation lasts around 10 months the cow is simultaneously pregnant and lactating for 6 to 8 months during each calving cycle. Cows have a 6 to 8 week period between lactation ceasing and their next calving. In order to provide you with milk, a food that we like every other mammal no longer needs after weaning, she is milked two or three times each day and often much more frequently. After giving birth her calf is taken away within twenty-four hours after the calf has taken the colostrum, which in all animals protects the young one from disease. However the calf is removed before he or she can have any of the milk which must all be kept for humans, a calf never has any of his or her mother’s milk. Cows are good mothers, they are severely traumatised when their calves are taken away from them, they can bellow for days. In his book, The Pig Who Sang to the Moon Jeffrey Mason tells of an account given him by an RSPCA officer concerning one particular cow, who was considerably distraught for a period of six weeks by the loss of her calf. When the calf was removed she was beside herself with grief, gazing into the empty pen bellowing for hour after hour, only moving when forced to do so. Even after six weeks she would stare into the pen, it was as though her spirit was broken as she gazed into the pen in the forlorn hope that she would find her calf there. Because of man’s interference a cow will produce as much as 7,000 litres of milk each year, an enormous amount far in access of that required by her calf, and three times the amount produced a century ago. This drastic increase is the result of injecting the cow with growth hormones to produce more milk. An outrageous and inhumane abuse of another living being; treating a cow as though she is nothing more than a milk producing machine, spouting milk rather like a spring spouts water. Cows are selectively bred, genetically manipulated, and fed with concentrated feeds and hormones, as a result they produce ten times more milk than their calf would have needed to suckle. The dire consequences of over milking result in the painful, distressing and potentially fatal condition of mastitis, an infection of the udder, the antibiotics forced up her udders do little to control the disease: antibiotics to treat mastitis are painfully injected up the teat canal. As a precaution many farmers inject their entire herd. And keep in mind such treatments are not to ease the cow’s suffering but rather to improve the cow’s continued viability as a milk producing machine. Her udders as a consequence of man’s interventions are oversized, as many as two thirds of cows become lame from foot and leg disorders that result from difficulties walking due to the huge size of her udders. Often she can barely walk, so heavy and cumbersome are her udders. The dairy cow is forced in the way described above to produce ten litres of milk per day, normally a cow’s udder will hold only 2 litres. The overload of milk causes the udder to become so heavy that it drags on the ground. Furthermore she becomes exhausted and her muscles waste away as a result of the enormous expenditure of energy required to produce these unnatural amounts of milk. After three years of such misery cows are utterly spent, exhausted and many die well short of their life expectancy of 21 years or more. There is a case of a cow in Ireland living until she was 39, so who knows cows may live longer in the wild than we realise. Those who somehow cope with the exhaustion, survive mastitis and other diseases are in any case slaughtered for their meat after giving birth to as many as eight calves, after between four to seven years of exploitation. Moreover as many as 25 percent of dairy cows are actually pregnant when they are killed. Yes you will see cows in fields of course but most are in milking sheds, like you see in the Animal Aid video above, dark dank places with concrete floors – a major cause of lameness – tethered in a narrow stall unable to graze or follow their natural inclinations. Rather like battery hens many cows are kept in such conditions all year round, only a very few are put out to pasture. Grass and other feed consisting of high protein diet to increase milk yield is brought to them. This is called zero grazing and takes the cruelty of dairy farming to another level; grazing is a strong natural instinct as is the rearing of their young. In even more severe and inhumane scenarios cows are intensively milked day and night by computer automated machines, the old fashion farm where a cow is milked twice a day, twelve hours apart is becoming a thing of the past. 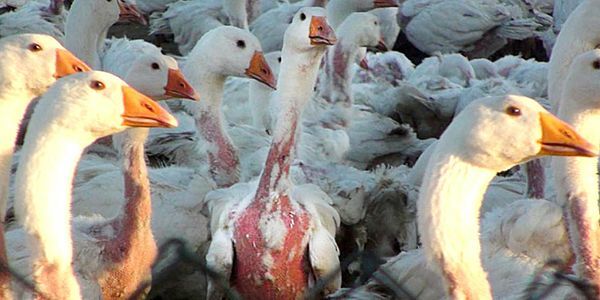 Demand a Cruelty Free Life for Geese and Ducks! Many outdoor brands use down feathers from geese or ducks in their products. Each company claims that the feathers they use are byproducts of the meat industry, implying products are cruelty free. However, down travels through many systems, farms and hands before it is made into a final product to be sold to the consumer. This makes tracing it back to the actual farm or individual flock of geese and ducks a challenge. Without traceability, it will be impossible to ascertain that live plucking and force feeding did not take place. While most of the outdoor brands state that they do not accept down from live-plucked or force-fed animals, evidence to back these claims is often missing. Please Note There is nothing Cruelty free about the meat industry, this is an animal welfare issue rather than an animal rights issue. There is no way that any animal derived product is cruelty free at any level. Live plucking is of course hideously cruel and needs to be stopped now and signing the petition may help in bringing this about and end this particular cruelty but this is not the end of the matter. 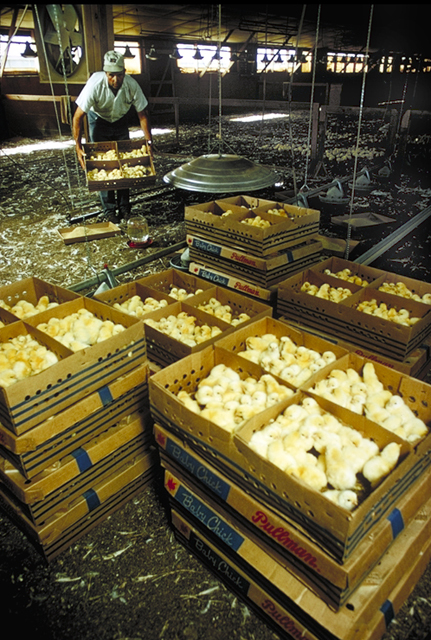 Here is what happens to geese and ducks and other poultry in the farming industry. Look at these tiny chicks, living beings packed in boxes as though they were inanimate objects. Millions of hens in Greece are still kept in barren systems. Take action for hens by calling on the Greek Government to enforce the law. Battery hens continue to suffer elsewhere, including the USA where roughly 95 percent of all eggs in the U.S. still come from caged hens and Australia where 11 million ‘battery’ hens are confined to small cages in which they are unable to perform most of their natural behaviours. Of course the USA and Australia are by no means alone in their continuation of this cruelty which takes place worldwide. Including tiny chicks ground up while they are still alive!! If you are unfortunate enough to be born a member of gallus gallus domesticus you are in for a truly miserable life. You will face immense suffering at the hands of your powerful primate-master. Various unpleasant fates await you – your life will go one of two directions – you will either be a chicken destined for meat consumption or you will be designated an egg-producing chicken. In fact you will get so accustomed to your roles that you will either be born a broiler (meat) strain chicken or an egg strain chicken. http://www.animalsaustralia.org/take_action/forgotten-battery-hens – if you live in Australia please scroll down the above page and take the suggested action and send a message to your state MP. Unfortunately being vegetarian of course does not tackle the cruelty of egg laying battery hens. While many decide upon learning about the suffering of these poor creatures to only use free range, this was the case for myself before deciding to take the next step from being vegetarian to vegan, this does not satisfactorily resolve the cruelty issue entirely. Though an improvement free range usually requires the death of the hen as soon as she cannot lay any eggs. The ideal therefore is to go vegan and exclude eggs entirely from your diet. Order Your FREE Vegan Starter Kit! If you eat eggs please think again. Eating eggs promotes cruelty, it is unnecessary and is not only bad for the unfortunate chickens but bad for your health. I have not eaten eggs for about six years. It can be done, there are alternatives and a cake cooked without eggs tastes little different to cakes cooked with eggs. You can even cook egg free flans. Queenie lost her battle to Egg Peritonitis, a disease that occurs when the contents of an egg are laid in the abdomen and becomes infected. Belle and Ruby both had similar issues, and have had significant operations and ongoing treatment. Queenie had always been the strongest of the three hens, but her illness was well disguised and we simply were unable to save her, despite an intense rush to the vet and orders to ‘do everything’ to save her. 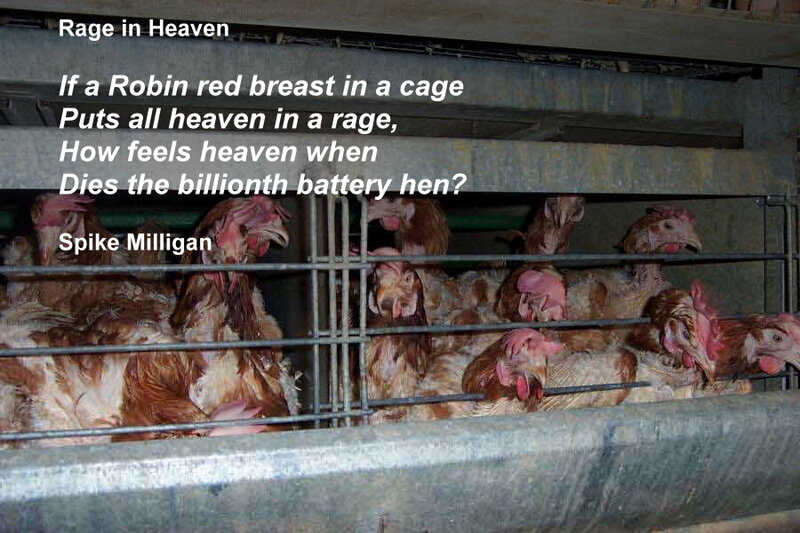 This disease is common in battery hens as their reproductive organs are so heavily overworked. Their tired little bodies cannot cope with a lifetime of egg laying in such a short time in unnatural conditions. Their condition was terrible. They had severe feather loss due to living their life in a cage no bigger than an A4 piece of paper per hen. They had their beaks cut and mutilated, as is standard industry practice, to stop them pecking other hens when they go crazy in their cages. They have pale combs and in some cases (look at Queenie) the combs are enlarged. They don’t know how to drink out of a bowl and don’t know how to eat anything other than pellet mash. They’ve lived their entire lives in cages, in a gigantic shed, with the constant noise of thousands of other chickens. These lovely, quirky ladies had never experienced sunshine on their feathers, grass under their feet, or the opportunity to stretch their wings. This moment was when we decided that could be no more, and we took them outside to discover the world that they should always have been able to experience. When a truck carrying thousands of hens overturned on the way to the slaughterhouse, sanctuaries from all over Spain stepped forward to provide the survivors with a second chance at life. Here at Mino Valley Farm Sanctuary, we were lucky enough to be able to give 45 of the little feathered ladies a home with us. As we prepared to share their story with the world, we decided what better way to help educate people about the individuality of the animals lost within the system than by giving each and every hen their very own photoshoot? Chickens are arguably the most abused animal on the planet. In the United States, more than 7 billion chickens are killed for their flesh each year, and 452 million hens are used for their eggs. Ninety-nine percent of these animals spend their lives in total confinement—from the moment they hatch until the day they are killed. Here in the UK an astonishing number of turkeys are killed each year. It is estimated that around 10 to 20 million turkeys are slaughtered in the UK every year just for Christmas – in addition millions of other animals suffer and die including pigs, chickens, geese and ducks during this so called season of peace and goodwill. Odd way to celebrate the birth of a man whom many believe to be a man of peace by the massacre of millions of sentient creatures who suffer as we do, animals whose lives are as important to them as yours is to you. 90% are kept in windowless sheds with as many as 25,000 other birds. Wild turkeys live for around 10 years, but those destined to be eaten are slaughtered when they’re between 9 and 24 weeks old. It’s not just turkeys though – millions of pigs, geese and ducks also suffer in a time of supposed peace and goodwill. According to those organisations promoting turkey meat, Christmas just wouldn’t be Christmas without a traditional roast turkey! But how ‘traditional’ is it really? In the USA 20 million are slaughtered for Christmas and 40 million for thanks giving. Ben Franklin called turkeys “true American originals.” He had tremendous respect for their resourcefulness, agility, and beauty. Turkeys are intelligent animals who enjoy having their feathers stroked and who like listening to music, with which they will often loudly sing along. 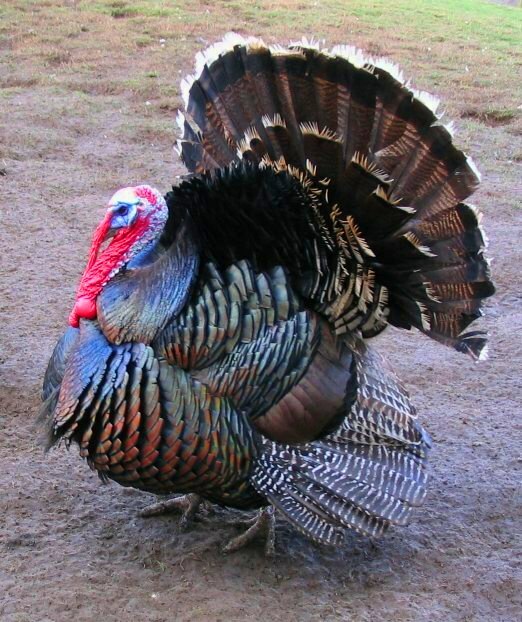 In nature, turkeys can fly 55 miles an hour, run 18 miles an hour, and live up to 10 years. But the story is very different for turkeys on factory farms: They will be killed when they are only 5 or 6 months old and, during their short lives, will be denied even the simplest pleasures, such as running, building nests, and raising their young. Like chickens, the 300 million turkeys raised and killed for their flesh every year in the United States have no federal legal protection.More than 45 million turkeys are killed each year at Thanksgiving alone, and more than 22 million die at Christmas. Warning very upsetting for people who care about animals. Every year in the United States, almost 300 million turkeys are killed for their flesh. Virtually all spend their entire lives on factory farms and have no federal legal protection. A short film from Animal Place about the rescue of a single turkey from a “free-range” farm, days before Thanksgiving. Though this film shows a positive outcome for one lucky Turkey it also shows the shocking conditions in which so called free range turkeys live. and of that proportion of life and time it had been born into the world to enjoy. In Great Britain about 10 million of turkeys are killed for Christmas. This film shows breeding and slaughter of free range turkeys in one of organic farms in Britain. Comparing to traditional and factory farming, organic way of breeding animals seems to be a healthier and more ethical solution. But even in strict organic conditions these sensitive and majestic birds suffer from unnatural conditions, decrease of living space -what leads to diseases, stress and aggressive behaviour. And after all, they have a short life on a farm, are raised only to be killed and later their meat is sold. If you think that an organic option is more humane, have a look at turkey slaughter in this video. In all cases slaughter always involves suffering, pain and fear. This year’s Christmas can be truly compassionate. Surprise yourself and your family with an amazing choice of vegan food and give turkey the gift of life. No indeed your conscience can’t really be salved can it? At the end of their time these sentient beings are cruelly slaughtered. Question the ethics of killing millions of living beings to celebrate a festival about which few really understand. Most people do so from habit, tradition and thoughtlessness. I know I was once of this mindset. Those of the Christian religion please question the incongruity of this festive blood bath to celebrate the birth of a person whom you consider to be a man of peace. The best way to end the suffering of animals is to go vegan – or at least start in that direction. We can help you do just that. Please also share this page with your friends and family so that they know how animals suffer and how they can help end that suffering. A turkey is not just for Christmas, a turkey is a thinking, feeling being with a life of his or her own. Below you will read compelling facts and anecdotes that demonstrate that a turkey is not an automaton driven by instinct, but like all animals he is a conscious being aware of and able to interact with his surroundings: sentient. Rabbits it seems are among the most mistreated of animals, from cosmetic testing to live plucking of Angora rabbits in China, to factory farmed rabbits in tiny barren cages who suffer unimaginable pain and misery. Today I would like you to please take action concerning the factory farming of rabbits in Europe. Watch the video from Compassion in World Farming, it will break you heart. Through the summer of 2014, Compassion’s Investigation Unit operated undercover in 16 separate rabbit farms throughout Italy, Greece, Czech Republic, Poland and Cyprus. What they found was appalling. Time and again, our team found unspeakable welfare conditions, the most barren environments imaginable, and hotbeds for disease, dependent on the routine use of antibiotics just to keep animals alive. http://action.ciwf.org.uk//ea-action/action?ea.client.id=119&ea.campaign.id=32239&ea.tracking.id=1174f49c&utm_campaign=cageage&utm_source=shared&utm_medium=link Important: this petition can be signed by anyone anywhere in the world. Just a machine, each doe is pulled from its cage for a few seconds to be inseminated artificially. She’s still rearing her un-weaned young but the next litter is already being planned out. By the end of the investigation I realised this was the only time the does spend outside of their cages. Their production charts show they’ve been here for 2 years –across the shed the males have been cage-bound for 4 years. They produce big litter sizes but with an inherent ability to be unable to look after them all – resulting in as many as 6 baby rabbits being culled from a litter of 16. For these rabbits, it’s a life encased in wire. But I shouldn’t call it a life really. It’s a three-month existence. An existence that takes away from these young animals everything that makes life worth living. What brief moments they get outside of their cages consist only of rough handling as they are moved between cages. The only fresh air they will ever breathe is on the drive to the slaughterhouse. The last time they’re lifted out of a cage it’s by a worker at the slaughterhouse; grabbing them by their ears and shoving them head first into an electrical stunner before having their throats cut. Please note as a vegan and an animal rights activist I am an abolitionist and would therefore prefer to see an end to the farming of animals for their meat and other derivatives. However I occasionally sign Compassion in World Farming’s petitions because any improvement in the conditions for farmed animals, particularly in such dire circumstances as appalling as those in these European farms, is a positive move in the right direction. https://ciwf.e-activist.com/ea-action/action?ea.client.id=119&ea.campaign.id=32141&ea.tracking.id=2d57aea1 I am not certain but I think anyone anywhere, not just the EU countries, may join the End the Cage Age campaign which requires only that you enter your e-mail address. I have to say again that while improving conditions is a positive step towards a better life for animals the ideal situation is to STOP eating meat or consuming any other animal derivatives and go vegan. Never think it is a waste of time signing petitions, writing letters and e-mail. Such actions often have the desired effect and bring about changes that would otherwise not take place. Here is the latest example. Last year a campaign by PETA and similar animal rights groups concerning the live plucking of Angora rabbits was very successful with many clothing retailers stopping the sale of Angora. JUST IN: French Connection has announced that it is ending the use of angora in the production of its clothing and accessories with immediate effect. This is wonderful news for rabbits, and for everyone who believes in compassionate fashion! This victory comes after more than 100,000 compassionate people flooded the store with emails, tweets and Facebook messages asking it to stop supporting cruelty to rabbits, who often have the hair torn from their bodies as they scream in pain on Chinese angora farms. So you see every signature, every share on facebook and twitter, every letter and e-mail makes a difference. Pleases sign the above petition, it is quite simple and requires only entering a few details.